When setting up a nursery for your baby, you’ll probably include a crib in your plans. Whether or not your baby will sleep there, though, is less certain. Plenty of parents prefer keeping their babies (especially newborns) nearby at night. These parents often sleep their babies in bassinets near (or right next to) their own beds. This practice is called room-sharing. In this article, we’ll explore all the ways (good and bad) that room-sharing affects sleep. However, before we continue, I should note that room-sharing and bed-sharing are not the same thing. Room-sharing is considered safe; bed-sharing, however, is inherently risky, if precautions aren’t taken. We’ll talk primarily about room-sharing in this article. Whether your baby sleeps in your room or you sleep in hers, there can be some definite advantages to keeping your little one close by. It’s breastfeeding-friendly. This is especially true if you use something like the Arm’s Reach Co-Sleeper; one side drops, allowing the bassinet to be pushed up right next to mom’s side of the bed. When baby is so close at hand, it eliminates the need to get up and walk down the hall, leading to faster nighttime feeds and more sleep for mom. You can monitor baby easily. When you and baby share a room, you’re better able to monitor him throughout the night. And this makes a difference: according to the American Academy of Pediatrics, room-sharing can actually help reduce the risk of SIDS. Some parents find that having constant access to their baby throughout the night actually helps them (the parents) sleep better, since there’s no wondering if baby’s too hot or cold, or if baby’s still breathing. Nighttime fussiness is quickly resolved. If you’ve read this blog for any length of time, you know by now that hunger isn’t the only reason a baby wakes during the night. Babies wake due to discomfort, or because they need their pacifiers replaced, or simply because they’re going through a sleep regression. And when baby’s nearby, it’s much easier for mom and dad to offer comfort. After all, simply rolling over and replacing baby’s pacifier is easy; walking across the house to do it (especially if you’re doing it 10 times each night!) is frustrating. 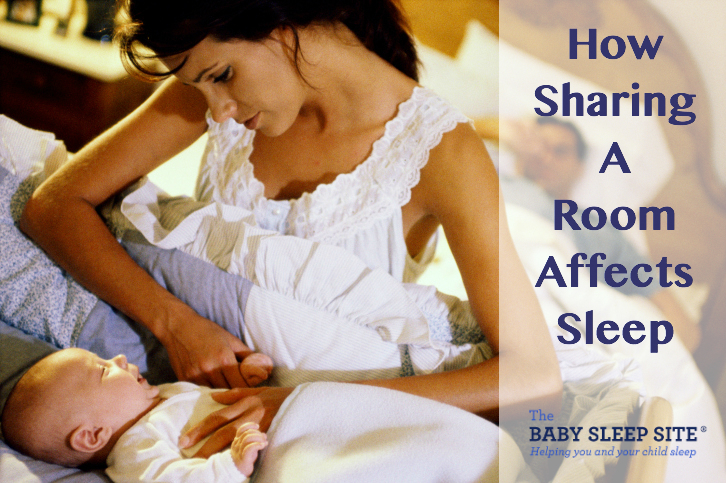 There are plenty of families who find that room-sharing disturbs everyone’s sleep (including baby’s). You hear every.single.sound. This was me! When my oldest son was a newborn, he slept in a pack-n-play right next to my bed. That arrangement lasted a grand total of 3 nights. Turns out becoming a mom had given me the hearing of a bat; every little hiccup or sigh or grunt from my son caused me to wake instantly. It wasn’t until I moved him down the hall that I finally started getting some sleep! Your baby may also hear every single sound you make, which is not so good, if you have a snorer in the family or an early riser. You might be tempted to check on baby constantly. This goes right along with the last point; when you hear every sound your baby makes, you end up checking on your baby all the time. (You know — just to make sure that sneeze wasn’t something serious! 😉 ) Not only does this wreak havoc on your own sleep; it can disturb your baby’s, too. Often, those little sights and grunts happen when baby is fast asleep; when you check on her, you risk actually waking her up. Your baby can develop less-than-ideal sleeping habits. This dovetails with the “nighttime fussiness” point in the last section. When you’re room-sharing, it’s easy to stop nighttime crying by offering the breast (after all, how many people can sleep next to an all night buffet and not eat? ), or replacing the pacifier. And that’s a good short-term solution; everyone will get more sleep on that particular night. But is it a good long-term solution? If that happens every night, your baby runs the risk of developing major sleep associations. And of course, sleep associations ultimately mean less sleep for you and, especially, for your baby. We’ve said it before, and we’ll say it again: there is no one-size-fits-all solution for baby sleep. Room-sharing is a perfect arrangement for some families; it’s decidedly not for others. We recommend finding the solution that allows everyone in your family to get the rest they need (including you!) That might be room-sharing; it might be something else. Have you tried room-sharing? Does it work for you? Share your story! Well my baby is 7 months and we do sleep, I want to put him in his crib and I tried once when he was 5 months but he wasn’t having any of it I found he sleeps so well with me only waking 1-2 times in a night for feed, I can sooth him better when he’s next to me I know people tell me he shouldn’t be waking up or do sleeping but I do what’s best for my baby that’s all that matter now why does he sleep full through the night when I’m awake? Or can’t sleeo? I have no idea..but I guess that’s another topic. Hi @Carrie – Thanks for sharing! Different things work for different families, and we appreciate these differences! If sleeping near your little guy works well for you and for him, there is no need to change it (as long as he is in a safe space of course). It’s also interesting that he seems to sleep better when you are not asleep! If/when you decide to move him into his crib, and if you would like help with this, we’ll be here! @ Mel — your comment made me smile 🙂 Glad for you (and for your neighbors) that your ocean sounds MP3 has stopped your hubby’s snoring! And glad your 7 month old is sleeping so beautifully! Hi have a 6year old daughter,4year old son and then b/g twins 18months old. Now in SA its winter and had a rule that all the kids can sleep in our room. the 2 big ones on matrasses on the floor and the twins still in their cots. Currently the 2 big ones have a room and I plan to move the twins into their own room mid of Sept. I just feel so comfortable with my kids “close” to me as to when they sleep in their own rooms I wake up more just to check if they are ok. The twins are basically the ones that keeps me awake during the night. Sometimes sleep between 3-5hours. I also found to when they were newborn that they slept better when they shared a cot and was close to each other but then they started to wake one another up-they cot shared untill 5months. We don’t tip toe in the room and we put on lights and watch TV in bed and they sleep sound.